If you haven't found an answer to your question, don't hesitate to get in touch with us and we'll see what we can do to help. In this article, we'll go over how to setup Zapier integration and how to push your call data into 1000s of other applications via Zapier. Our Zapier integration is available to all users and the data that is available to you in Zapier will be the same that is available in the Call Tracker application. Login to your Zapier account and follow the Make A Zap button just as you would with any other Zapier integration. If you dont have a Zapier account, you can create a free one here. Next, choose Call Tracker as the Trigger App because you'll be pulling data out of Call Tracker to push it into another application. Once, you've found Call Tracker, select and press the continue button. New Completed Company Call - Triggers when a new call is created for a selected company. New Company Usage - Triggers when a new usage is created for a selected company. 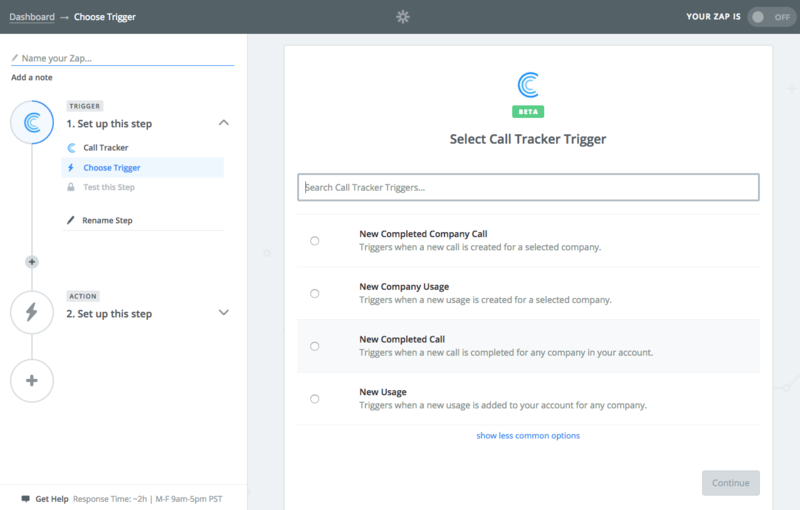 New Completed Call - Triggers when a new call is completed for any company in your account. New Usage - Triggers when a new usage is added to your account for any company. New Company - Triggers when a new company is created. If you're just getting started, we recommend using the New Completed Call trigger as it will be used most often. 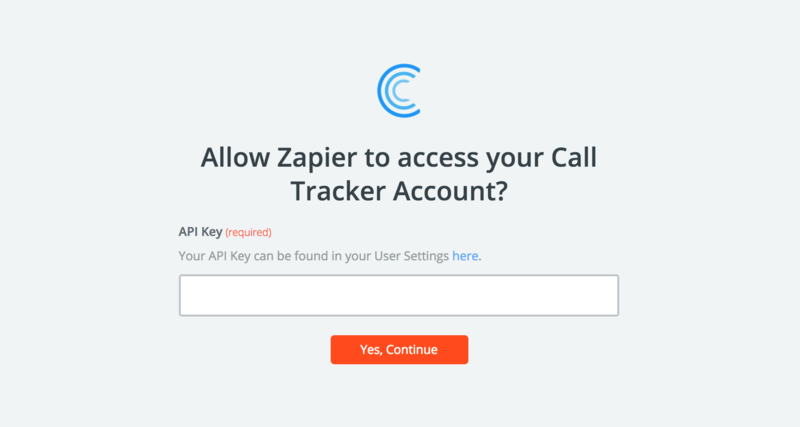 Next, you'll be prompted to connect your Call Tracker Account to Zapier, press the Connect New Account button to get started. Your Call Tracker API Key can be found here. Keep following the Zapier Zap setup prompts and choose the application you want to push the data to and you're all set to go.